Sometimes reality just won't do; that's where Sade comes in. There are rare living figures in music that have built such mystery around themselves, they're more a concept than a person (think: Prince). Sade Adu is one of those artists. Shattering the mythical aura this reclusive Nigerian-British chanteuse possesses, she and her eponymous band stepped onstage at the Rose Garden, delivering two hours of rhythmic soul-pop enhanced by seductive, otherworldly video projections. 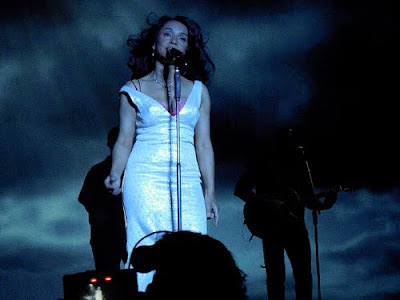 Just now hitting the road in support of Sade's platinum 2010 album Soldier of Love, the group kicked things off with the record's punchy title track. Alluring, adorned in black and tiptoe-strutting across the stage, Adu was in fine voice and focused throughout. A technically locked-down, tightly orchestrated revue of her three-decade catalog, the show's strongest moments were revealed in favorites, from the subtle, elegant "Your Love is King" and the sax-driven "Smooth Operator" to passionate torch songs like "Is it a Crime" (a standing ovation-garnering highlight) and the pained yet resolute "Jezebel." Belting it out and armed with dazzling staging and production, Adu gave ticketholders their money's worth. And in a move seemingly aimed at showing her at her most relaxed and "normal," a video was shown during the new song "Skin" depicting the singer with her hair down, frolicking through a field of flowers, relaxed, and smiling. It was an unexpectedly revealing glimpse that dispensed of the glamour and exposed another side to her. On the downside, there were a few obscure songs performed that were more memorable for the glitzy special effects that accompanied them than the actual music. A valid criticism of Sade's catalog is that it tends to spring from a bit of a slow, monochromatic smooth jazz well, and the energy flagged at times. However, when the drums, horns, and keyboards surged, Adu soared skyward, as on the percolating "Paradise," and during "The Sweetest Taboo," when some fans made a point of rushing to the aisles and dancing. Ethereal yet humanized, intimate yet distant, by the time Adu sent "No Ordinary Love" cascading over the audience, all in attendance had been transported to her sophisticated, timeless world. Modern R&B hitmaker John Legend gamely filled the opening act slot with a crowd-pleasing yet unchallenging mix of piano-driven, Top 40-ready tunes that split the difference between Luther Vandross and Marvin Gaye, which sounds better than it actually was. Legend's a photogenic, lively young artist with class, but some growth is needed. He's got the horn section and the backing singers, but what he really needs is a little James Brown.